**Note– I aim to ensure that all of the reviews found here remain “spoiler-free.” This review for one of the most anticipated films of the summer is no exception. Feel free to read. Starring: Christian Bale (Batman Begins), Anne Hathaway (The Devil Wears Prada), Joseph Gordon-Levitt (Inception), and others. The conclusion of Christopher Nolan’s telling of the city of Gotham’s Caped Crusader makes its way into theaters. Amidst high expectations from fans worldwide, The Dark Knight Rises teams director Nolan up once again with Christian Bale, Michael Caine, Gary Oldman, Morgan Freeman, and many more…and, as expected, their work together does not disappoint. Nolan’s more realistic view of the origin and adventures of the Dark Knight which began in 2005’s Batman Begins and continued in 2008 with The Dark Knight concludes in this tale that picks up approximately eight years after the events of the second installment in the trilogy. (More movie trilogies should be like this one!) The Dark Knight Rises continues the saga and aptly references several important scenes, people, and events from the previous films. This use of tying them all together strengthens the story and allows for a seamless presentation that refrains from being disjointed. While the transition through the films is highly impressive (I watched Batman Begins, The Dark Knight, and The Dark Knight Rises back-to-back in a theatrical marathon Thursday night! ), The Dark Knight Rises begins in a similar, yet slower, style whose pace struggles to find its footing in the beginning as further foundation is laid. Since eight years have passed, there is much to catch up on. The inclusion of several other new characters, as interesting and exciting as it is to see, creates a sense of misdirection and a search for clues as to the way in which the story will turn. To state that audiences are forced to muddle (Too harsh a word??) through the character catch up and development with story sprinkled throughout at the beginning may sound like a negative thing. However, the beauty of Nolan’s directing is the puzzle and mystery he presents in his films. Coming from a storyline that remains very popular amongst Batman fans, Nolan proficiently balances the “familiar territory” along with the “fresh and new” to keep audiences on the edge of their seat guessing throughout. Even though the beginning is somewhat slow, it has purpose and creates a much greater foundation for the film’s climatic events that follow. With such an impressive cast, anyone who inevitably attempts to reboot Batman in the future, I fear, may not be nearly as successful. All those who remained dubious over Anne Hathaway’s “Catwoman”, Tom Hardy’s “Bane”, or anyone else for that matter…fear not! I implore you to remember the statement of online fame that still rings true: “In Nolan We Trust.” Each actor performed admirably and so believably in their respective roles (although, I do question the necessity of Juno Temple’s character). 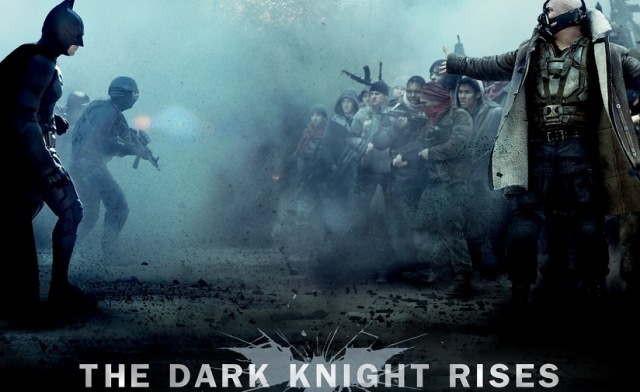 Even darker than the previous versions, The Dark Knight Rises reflects the characters in the story and their struggles in terms of tone and presentation. 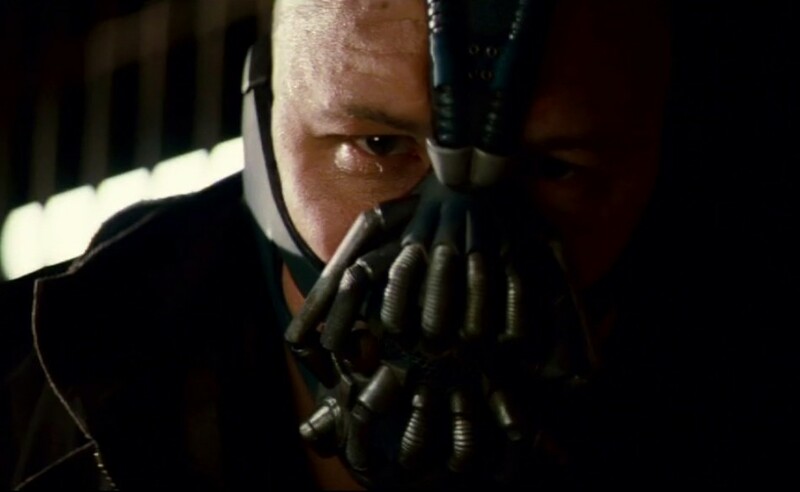 While Heath Ledger’s performance in The Dark Knight amazed and kept a sense of humor in the film, Hardy’s “Bane” brings with it every bit of ominous feeling and emotion that is necessary for such a villain. Amazing visuals, cool technology (bat-gadget galore), nail-biting fighting sequences, weighted drama, and unbelievable sequences of events permeate throughout this entire impressive and realistic presentation. Nolan and crew keep audiences on their toes in anticipation of how exactly the trilogy draws to a close. Very little will disappoint. Loaded still with plenty of gasp-inducing surprises, fan-beloved easter eggs, fist-flying action, character development/portrayal, some “I-told-you-so” moments, and an amazing musical score (by Hans Zimmer who composed the previous two for Nolan), The Dark Knight Rises is a dark film that sheds light on so many aspects of the Batman, Bruce Wayne, Gotham, and director Christopher Nolan’s continual ability to impress and entertain. 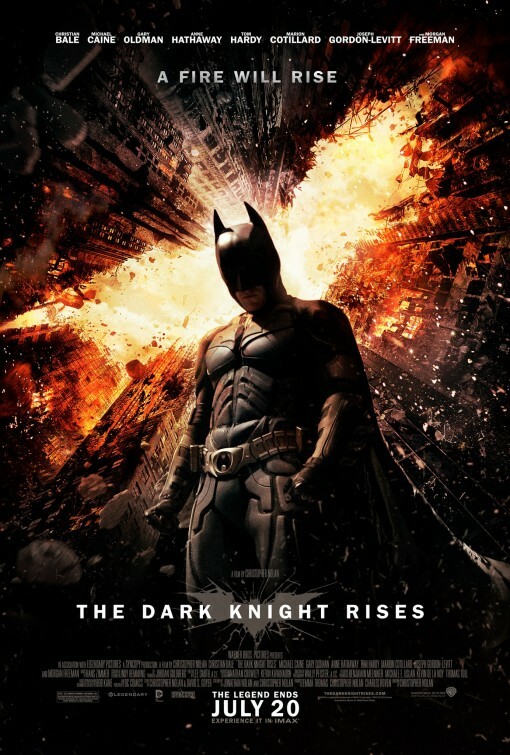 Ending in fashion that has met with more approval than dismay by fans around the world, The Dark Knight Rises concludes the saga in a way that presents a pleasant source of completion for this movie lover. A much more gritty and darker movie, it more accurately portrays Batman better than any of the films of the ’90s. You will want to celebrate, cry, yell, laugh, smile, and fear as you watch. This is a trilogy that has earned a sacred spot in my Blu-ray collection…right next to the open spot the awaits the special edition Blu-ray release of The Avengers. The Dark Knight Rises: a MUST-SEE! Thank you, Christopher Nolan. Thank you. Bravo and great review T! I agree with what your view of this film! I have been open about my hesitance about getting too hyped for this film because of how amazing The Dark Knight is (easily in my top 5 favorites all time) but Nolan delivered. Thank you sir! I really enjoyed it and was glad that it was so well done. Nolan did indeed deliver. Aside from an odd bit of pacing/direction in the beginning, everything else just really seemed to work so well. Although, Alfred just…well…he broke my heart in all the scenes he was in. Wow. Great movie, glad you liked it. I thought it was a really great Movie where all the casting was wonderful. They finally got great female characters and the actresses did them justice. While Ledgers Joker still stands out in the franchise in my opinion, Hardy broke the mold as Bane and Anne stole all doubt that she could pull off CatWoman. Excellent job by Nolan and Zimmer concluding the trilogy, they certainly didn’t disappoint. Really excited to see how they pull together my movie. Thank you for the comment Anon (a.k.a. Kal-el). Hardy and Hathaway did indeed do an amazing job in their roles! Your movie is right around the corner. fortunately for you, Nolan is producing it. I didn’t quite love it as much as you, but I did like that they finally did justice to Catwoman by making her a non-magical cat burglar like she’s supposed to be. Yeah, I always wondered why the other movies turned her into some innocent lady turned crazy-catmagicpowered-psycho. Never made any sense to ruin her like that. It would be awesome to have Bale and Nolan read my review! ha. but the chances of that are slim to none! And good point on Hardy erasing the memories of Bane in the previous saga. He was so sinister and I loved it. Good review T., I really liked it too. I agree that the film was kind of all over the place in the first half hour or so but after that, it was entertaining. Thanks Ted. How was it on Imax? did you get one of the promo posters? It was great seeing it on the six stories screen and of course the lossless surround sound was pretty awesome too. I don’t think they gave out any promo posters for the advance screening, maybe they did earlier. I arrived at the theater 10 minutes before showtime, so maybe they already gave out the posters. I’m planning to see it again on that same theater since it’s the only true 70mm IMAX in MN. Too bad they have one near your area. Man, I am still so super jealous of the IMAX. Glad you could check it out. I am excited that they are building one in Albuquerque. It may be done in time for Man of Steel, I hope. Very very very happy. This was the perfect ending to my favorite superhero series. 🙂 so glad it met up with your approval. it was also nice to see you quoted in the newspaper this past week! I’m extremely happy with the film. As a filmmaker and a life long comic nerd I definitely shed a tear of joy for this film lol. Good review T.
Oops sorry for double post fail. Thank you for the compliment on my review. I thoroughly enjoyed the movie. Great review, T. I share pretty much all of your sentiments on this film. For me, it’s a better film than The Dark Knight, marginally. But then again, I hold Batman Begins above The Dark Knight. It’s the sheer drama and emotive density of this film that I loved. The scenes between Bruce and Alfred just tore a hole in my heart. The scenes of Bruce in the prison did the same. He was a broken man. Heck, the film was filled with broken people. Filling a broken city. Thanks Jaina. Man, there was so much drama and dark tone in this film. I enjoyed it. I’m not sure I can say I enjoyed it far better than the Dark Knight, but “marginally” is a good way to describe it if I were to. 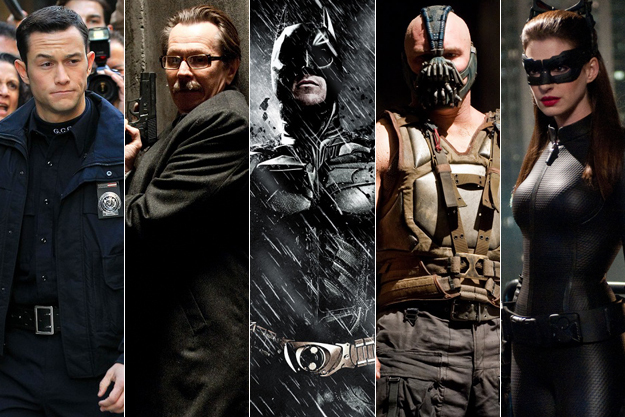 Each film really stayed true to the tone and feel of its title: Batman Begins, The Dark Knight, The Dark Knight Rises. Kudos to them in that too. Glad you Loved it. So did I. Thank you for stopping by. And how many trilogies have had such brilliant films? Usually there’s always a very weak standout film. But not here. Too many non-essential storylines weigh the story down. The dark tone is overbearing. The chief villain is comical in bad ways and poorly motivated. I enjoyed it, but mainly for pre-existing attachment to the characters, a couple of very good scenes here or there within, and of course, I’m a sucker for superhero movies. But this movie has flaws that – if it weren’t Christopher Nolan and Batman – people would be shredding it for. I’m w/ Fogs on this one, T. I enjoyed it mind you, but I have to be fair and still point out the flaws as I see them. As you know I appreciate Nolan’s work but I feel that for some reason he just didn’t have it together as he did in the last film. There were just too many things going on, but that’s just the tip of the iceberg. I too am a sucker for superhero movies [especially me being more of a DC girl and a longtime Christian Bale fan] so I still give this movie 4/5 despite the flaws. But because of those, no I don’t think this is the best movie of the trilogy. Not sure though which storylines you see as non-essential. the dark tone was overbearing but true to the film and its title. 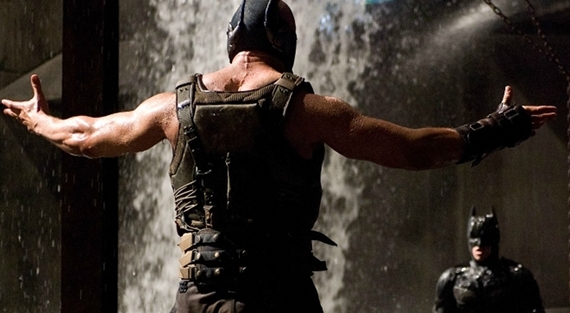 Bane, poorly motivated? we def do not see eye to eye on this film at all…and yet, still, you gave it a good score. Very perplexing weekend! ha. We gave it the same score, ha! I loved this movie and I really do feel like it’ll be one that people will appreciate more in 6 months than they do now. Expectations were just too high for most people. Great review, can’t wait to see this one again!